The import/export function which is already included in OBS wasn't enough for me so I made this little tool which is supposed to help you keep an overview of your saved OBS configurations. For now you can save new backups, add notes to them, give them names and see what encoder you used. 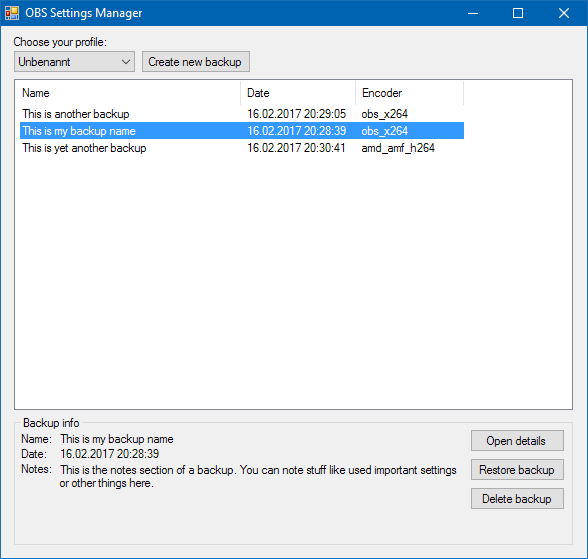 You can also take a closer look at the settings you used in your backup and get them nicely listed up. But of course I have plans for more functionality and this is just my first version of the tool! Please keep in mind that this is till a pretty early version of the software and if you find any bugs, issues or have any ideas please report them on GitHub.com! Version 1.1.0 Release! Sorting and fixes. Seems to work out pretty good for me. Nice and neat tool!